SASCO waste grinder range from small, compact units up to mammoth waste shredders that quickly cut problem solids down to size. Two rows of sharp, steel cutters rotate slowly and with incredibly high-torque to turn large troublesome solids into tiny particles.Contact us if your waste needs to be grinded. We are an Indian manufacturing company. 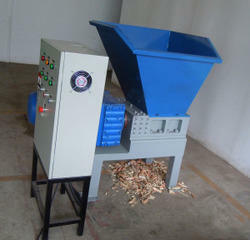 We manufacture all size of Shredder Machine at best price without any quality compromise. ThisFood Waste Grinding Machine is the best for shred food wastage without any complication. We offer quality range of waste grinder machines,which are ideally used for grinding plastic scraps. These machines are manufactured and deliver at stipulated time. We use high quality of raw material like alloy steel for fabrication of machines. These machines are widely demanded and accepted due to its salient features like sharpened blades which reduces power consumption and increases the work efficiency. We also export the products through several shipment modes for the ease of our clients.Contact SASCO if your interested in buying one.